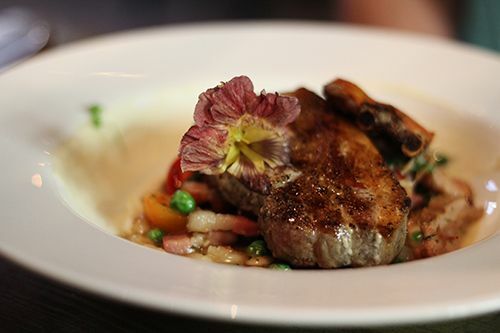 Given the vast stretch of prairies we find ourselves in, and the numerous farmers markets in the city, it's no surprise that farm to fork dining is a growing trend here in Edmonton. 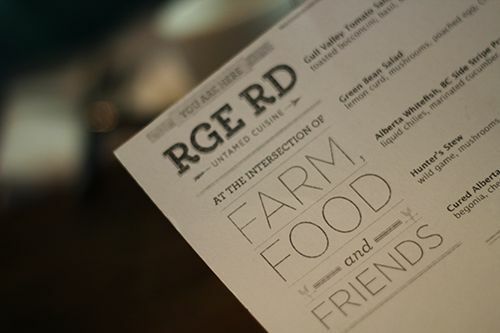 RGE RD is another addition to the culinary scene that does just that - offers sustainable dining and supports local producers in and around the Edmonton area. At the intersection of farm, food and friends, we find Chef Blair Lebsack, a talented chef, local food advocate, and once culinary instructor at NAIT. I remember many times reading about his RGE RD dinners held at the Nature's Green Acres farmland, wishing I had the time (and money!) 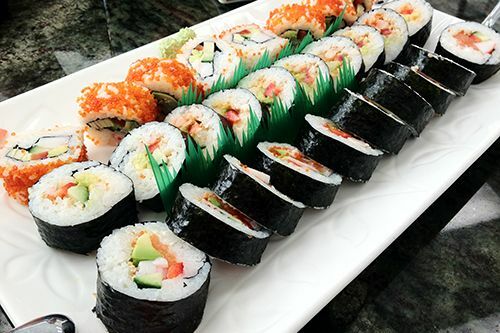 to attend the summertime meals. So luckily, Chef Lebsack decided to bring the concept into the city, opening up a 40 seat restaurant for all to enjoy. Arriving to the restaurant, it doesn't seem to special when looking from the outside. But once you walk in through the doors, the dim lighting and wooden decor gives it a homey feel. 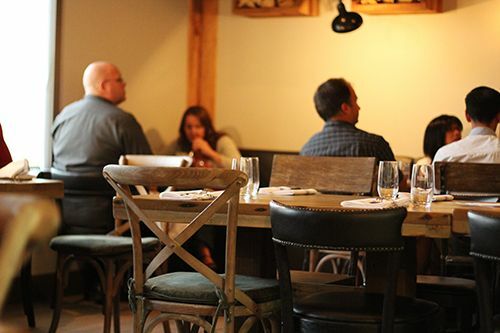 The rustic environment is cozy, and with the many tables in the dining room, it makes the dining experience more intimate. As the menu is dictated by what is available seasonally, it will be changing constantly. To start off the meal, I ordered the Front Porch Iced Tea for the day, described to be made with whatever was picked from the garden for the day. 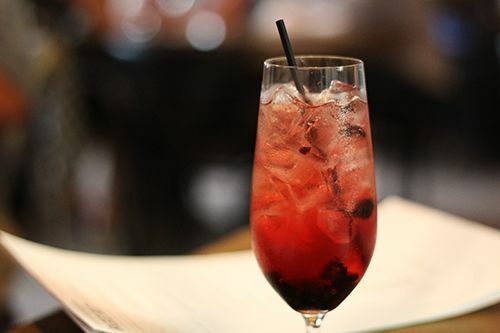 That night, it happened to be a Maple & Saskatoon Berry Spritzer, made with maple soaked saskatoon berries. The maple flavour was evident, and the berries were quite sweet, making it a tasty drink to accompany my meal. To start the meal, we chose the Alberta Whitefish with BC Side Stripe Prawns ($12): liquid chilies, marinated cucumber, urban greens. 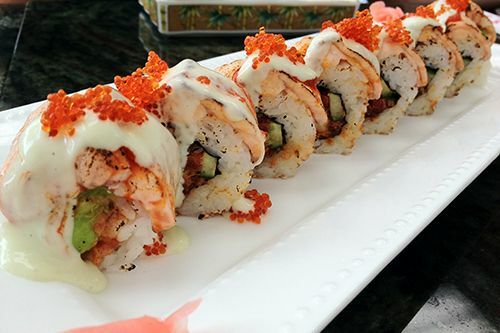 First off, the presentation of the dish was beautiful. A giant piece of whitefish, accompanied by 3 smaller prawns was served up with a medicine dropper-esque contraption, filled with liquified chilies - which I believe was a mix of Habanero chilies and cayenne pepper. 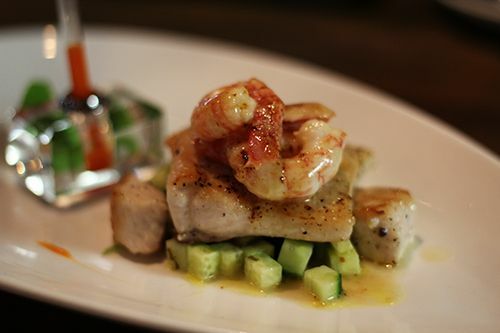 The fish was tender and flaked beautifully with each bite, and the small but meaty prawns in the tangy sauce were a great accompaniment. The liquid chilies were quite hot, and added a nice kick to the dish. As my main, I ordered the Nature's Green Acres Whole Hog served in two courses ($29). First up was hog belly served with spicy coleslaw, and I was actually a little shocked as to how small the piece of pork belly was. Size aside, the belly was tender and fatty, and seasoned in such a way that it reminded me of Chinese BBQ pork. 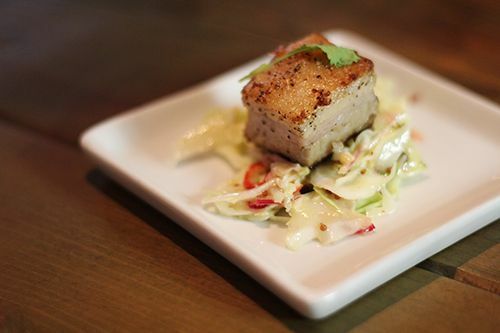 The slaw itself was crunchy, quite spicy and tangy, cutting the fattiness of the pork belly. The second course with the hog was written as the loin served with hock and beans - but what arrived infront of me was better. I got a large portion of loin served on top of their summer cassoulet with seasonal vegetables and white bean puree. On the side was also a piece of what appeared to be small ribs, seasoned with a thick tomato paste. The loin was tender and juicy, seasoned lightly to allow the natural flavours of the pork to shine through. I found the cassoulet to be quite salty though, and was only able to eat it paired with the pork - not on its own. The second entree we ordered was the Pilatus Farms Bison ($29): barley, kohlrabi, pickled walnut, pork jowl, onion. 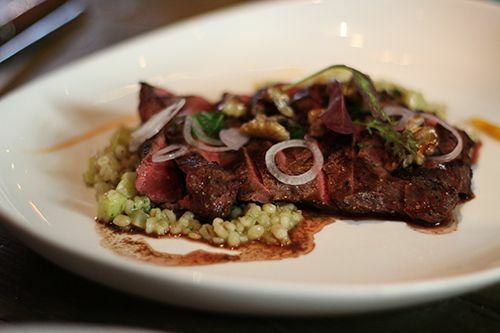 The medium rare bison sat atop a bed of barley mixed with kohlrabi, while small slivers of onion and the pickled walnuts accented the plate. In comparison to my hog, this dish was bland. However, eaten on its own, I really enjoyed the subdued flavours, and was able to appreciate each component on its own. The combination of different textures on the plate kept things interesting, although I can't say I'm a big fan of the pickled walnuts. For something that typically has some bite and crunch to it, the walnuts were soft, and didn't have the resistance a regular walnut would have. My boyfriend enjoyed them though - so to each their own. To finish off the evening, all the desserts on the menu sounded delectable, but we ultimately chose the Chocolate S'more ($9): chocolate sable, graham wafer, chocolate truffle, vanilla marshmallow, ice cream. When it arrived, it just looked so cute and was the perfect size to share between two. 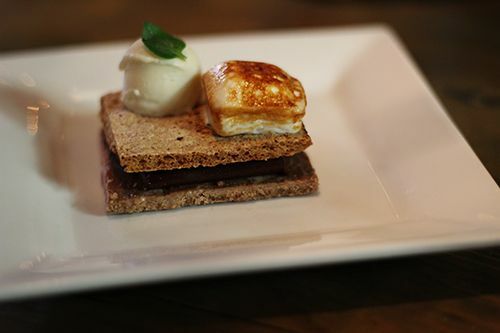 It wasn't too sweet, and wasn't messy, making it the perfect s'more for me - only thing is that it was a tad cold and the graham wafer was pretty tough to break. I loved the toasted marshmallow, and even the vanilla ice cream had a slight smokiness to it, bringing the campfire to the table. Leaving RGE RD with my belly full, the meal service was lovely and the food was delicious. 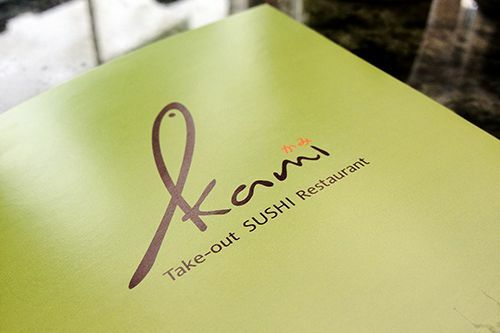 Given the pricing on the menu, I will say that this isn't going to be your everyday choice for dinner, but I would definitely recommend it for special occasions and dinner dates. One thing I noticed on the menu was the RGE RD Trip, a six course tasting menu available for $70+, with no advance notice necessary. Wine pairings are available as well for $50, but if you know tasting menus, $70 per person is a steal! I'm sure I'll be back in the future to check it out, given that the food was excellent. Happy Monday! I'm still off on holidays, but had to take some time to catch up with you all! I spent the last couple days along the northern Oregon Coast and had so much fun - catch up with me via Twitter & Instagram for updates! 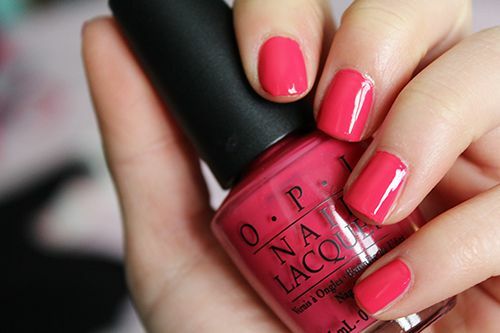 This week I have another one of my summer favourites to share with you all - OPI's You're Such a Kabuki Queen from the 2005 Japanese collection. Oldie, but a definitely goodie. 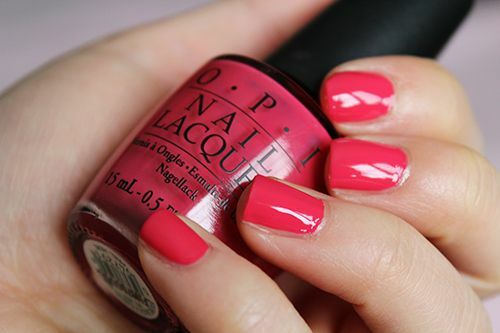 It's the perfect watermelon shade to wear on nails for the summertime, and more often than not, I actually wear it on my toes. This creamy shade has a wonderful formula, flowing easily onto the nails upon application and it levels out quickly all on its own. With up to 5 days of wear chip free, what's not to love? If there's any city that I feel knows how to do brunch, it's Calgary. 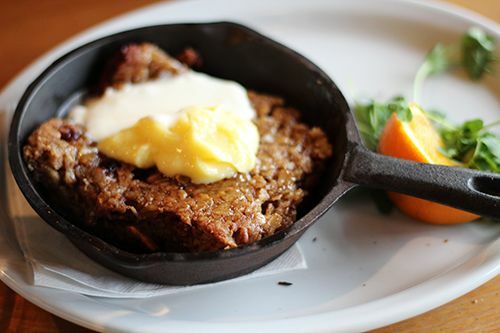 Every Saturday or Sunday morning, local restaurants in the Calgary region offering brunch are bustling with activity, and the wait times are never-ending. Luckily, one of my last trips to Calgary resulted in stumbling across brunch where reservations were accepted. 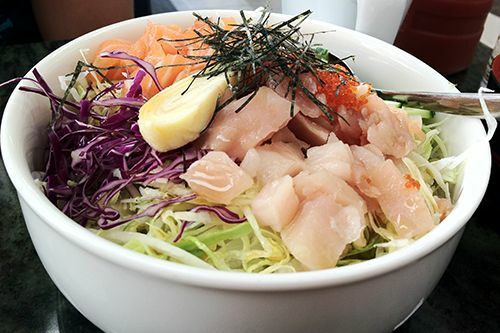 As you can probably imply from the name, Big Fish is known for their seafood. With a commitment to sustainability by participating in the Oceanwise program, and supporting local businesses, I'm surprised I hadn't heard of them before. Oyster nights, fish, seafood paella, and other crustaceans can be found on their menu throughout the week, but I had no idea what they would be serving up for brunch. Walking in shortly after 9 AM on Sunday, the restaurant was practically empty, giving the group of 7 of us the restaurant to ourselves. We were greeted warmly upon arrival, and seated with our drinks and menus in hand shortly after. 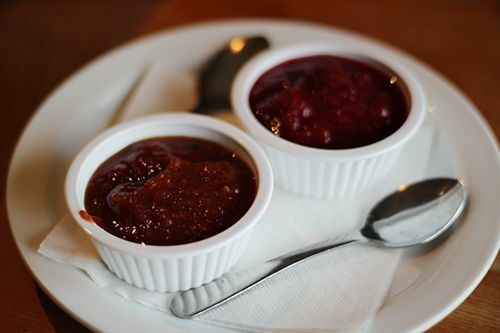 Once we placed our orders, a plate with housemade ketchup and jam was brought to the table to accompany our dishes - and both condiments were delicious. 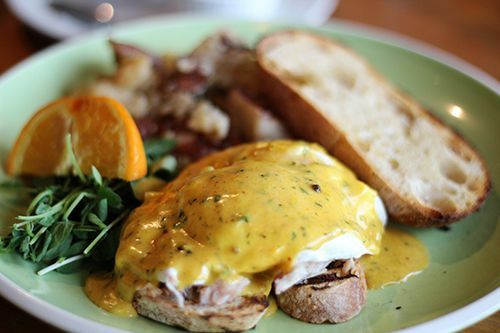 For myself, I had the Dungeoness Crab Eggs Benedict with Basil Hollandaise ($14), which came out with smashed red potatoes, baby pea tendrils, and Sidewalk Citizen's toasted bread. My eggs were soft poached perfectly, yolk oozing over the top of the entire dish when broken open. I love that real crab meat was used in the dish - its so rare, so I love being able to order fresh crab off menus when its available. The hollandaise was thick and creamy, but not overpowering, so that I could still taste the crab itself. With tender, flavourful potatoes and crisp toasted bread, the dish was perfect for brunch and I didn't feel overly stuffed. If you're a seafood fan but your culinary counterparts are not, the brunch menu at Big Fish is diverse and has something for everyone. 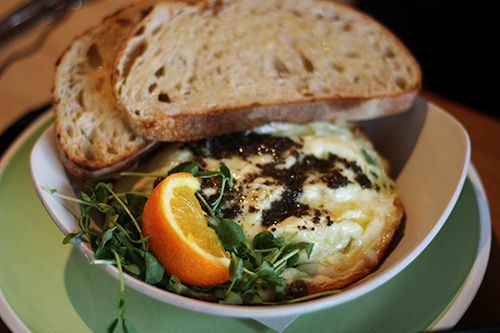 The portions are perfect for brunch, and everyone at the table enjoyed the dish that they ordered. Most dishes run in the $12-$15 range, making brunch affordable, and with reservations accepted, there's never a wait. 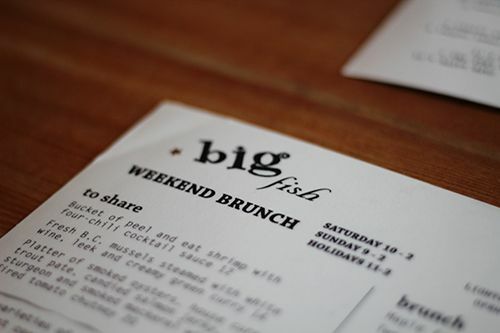 I would return to Big Fish for brunch without hesitation - heck, I actually really want to join them on Sunday nights for the traditional seafood paella! Happy Monday! It's the start of a new week, and the start of my holidays, so let's make this post short & quick! This week I have something completely different to share with you - one of which I'm sure many of us ladies are familiar with: the hair straightener. Two months ago, Misikko contacted me and offered to send me one of their best flat irons to try out and review. Misikko carries a wide range of salon grade flat irons and hair dryers, and I'm actually amazed with the fact that there are so many different ones available out there! 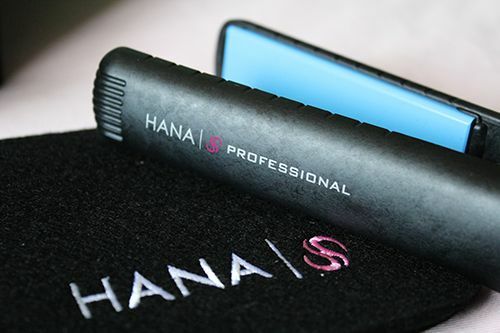 The one that I received is the Hana Professional 1" Ceramic Flat Iron with Tourmaline. 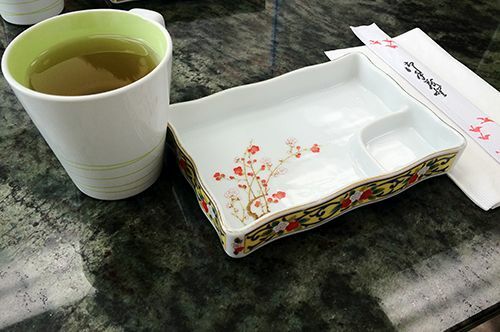 The tourmaline component is incorporated into the ceramic plates that should hold up and never peel or split with use. Tourmaline itself is a mineral, and when used in the plates it generates a negative ion boost to give hair shine by neutralizing the positive ions in our hair to give healthy, smooth results. 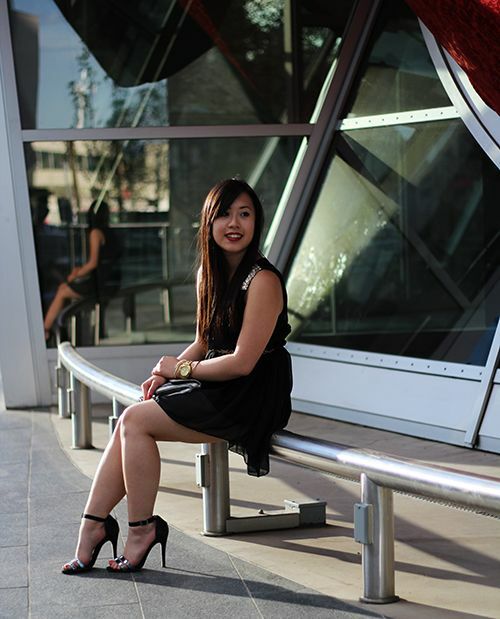 The flat iron promises to provide maximum frizz-free shine, and has "floating plates" so that it can glide over any amount of hair of any texture to straighten it. With the ability to flash heat between 140-450 degrees Fahrenheit, it seems to promise quite a bit. 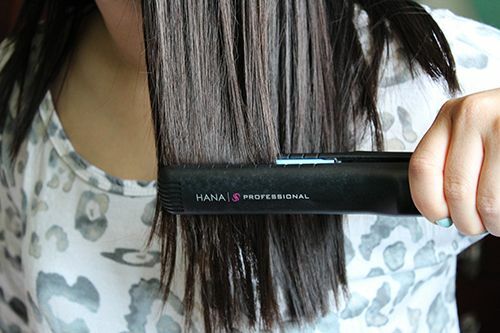 After 2 months of testing out the Hana Pro flat iron, I have to say I quite enjoy it. Once the iron is turned on, it heats up almost instantly to the temperature I need. The plates guide very smoothly against my hair, without feeling like its pulling or gripping tightly onto my hair strands. It straightens my hair faster than any other iron I've purchased in the past, and the results are long lasting. My hair just feels so straight and smooth after use, and I would definitely recommend this iron! Now this iron can be used with wet or dry hair, and it works equally as well for curling hair. I actually love using this for curling as it gets the job done so fast! This particular flat iron retails for $205, but is currently on sale at Misikko for $130! So take a look if you're interested - all flat irons from Hana come with a silicone heat proof mat and a heat resistant storage bag for safety and portability. Whenever a new restaurant plans to open up in Edmonton, people here get pretty excited. There was so much buzz on social media about the opening of Plow & Harvest - not to mention, tons of giveaways for invitations to their exclusive sneak peek tasting before opening. I was included in the bunch of people excited about the opening, 'cause who doesn't love comfort food? The winter months here can be horrible and there's nothing better than a hearty bowl of soup or a heaping portion of mac 'n' cheese on a cold night! 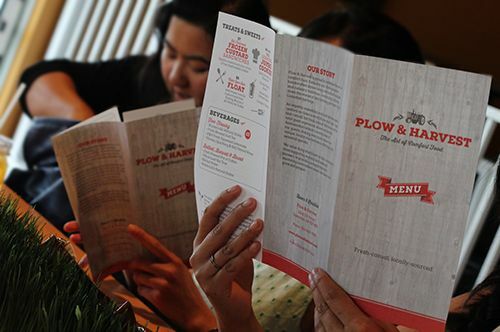 Like the name suggests, Plow & Harvest aims to focus on making connections with local producers, to use their product to create the familiar flavours in comfort food that we all know and love. 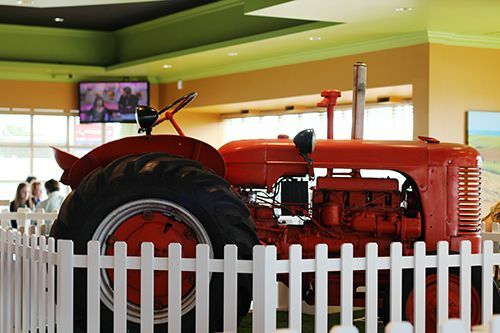 Walking into the restaurant, it really does have the farm and countryside feel - white picket fence and tractor included! The wooden accents and decor have a homey, rustic feel to them, and the large windows allow for lots of natural lighting. During the night, I had the chance to speak with Chef James Bailey, who was on the team that came up with the concept for the restaurant and designed the current menu. 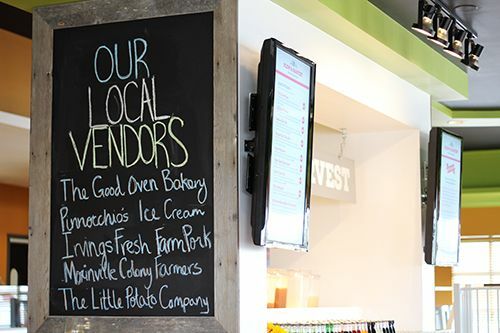 A chalkboard around the side of the restaurant highlighted some of the local connections that the restaurant has already made, and he informed me that the restaurant is continuing to seek long-term relationships with farmers so that the menu can be as local as possible. In the next printing of the menus, the names of producers will be printed in the description of the dishes, so it will be great to see the recognition there. I have to say though - he did mention that Irving's Farm bacon is the best he's ever had, and I've got to agree! At each table we noticed a tablet that had a program to peruse the entire menu. With the device, you were also able to put in your orders and even pay with a credit card on the spot. Pretty nifty, but it takes out the aspect of socialization with your server. Another feature of the restaurant that I appreciate is the openness of the space. The kitchen is open and visible to all patrons, and the tables are set at at a good distance from one another to allow for privacy. There aren't any major barriers that block one side of the restaurant out of view from the other either. 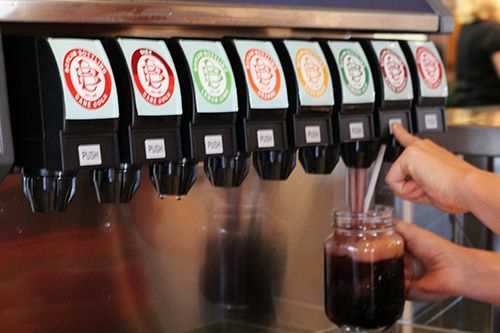 Aside from their list of local beers and wines to drink, Plow & Harvest offers Boylan's All Natural Sodas on tap and in bottles. Seven different flavours are available - with cherry cola, ginger ale, and lemon lime to name a few. I tried out the Cane Cola and Root Beer while I was there, and did enjoy both. The sweetness is less pronounced compared to their typical counterparts as cane sugar is used. The root beer actually reminded me of the old fashioned root beer you can get at the fair - so now you can get that flavour year round at Plow & Harvest! But enough about the restaurant - lets talk food. 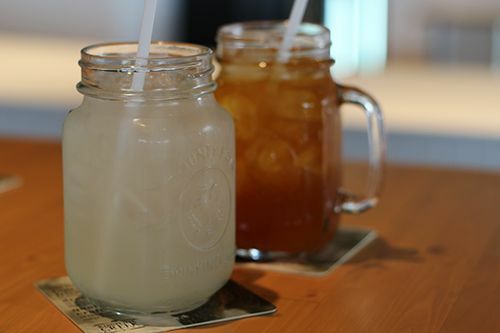 When we arrived, our server immediately offered us the fresh brewed iced tea and the fresh squeezed lemonade. The iced tea wasn't very sweet, so the bitterness of the tea was quite apparent. The lemonade on the other hand was quite tart, and I would have preferred it to have more water in it. After the ice melted down a little, it was much easier to drink and tasted like a homemade lemonade. 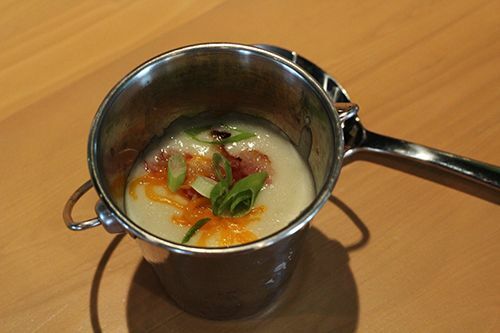 The first item out to the tables for tasting was a small sampler of the Baked Potato Soup. Plow & Harvest describes it as a creamy potato soup with smoky bacon, sharp cheddar, sour cream and green onions - and that's exactly what it was. A thick, creamy soup with small chunks of potato, and smokiness from the bacon. I would love having it on a cold day, but would prefer for it to be a little less salty. Others at the table found the saltiness to be acceptable, so I guess it's just me with a palate that prefers things a little less salty. 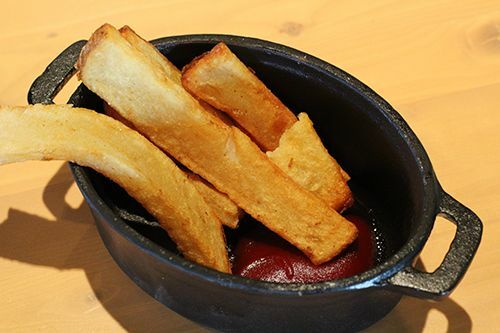 Next up was the Hand Cut Plank Fries, and their shape really did resemble planks of wood. My serving was a mix of slightly crisp and limp fries, as they had evidently cooled down already before leaving the kitchen. If served right away after frying, I'm sure they would be hot and crisp. Pickles were the next to show up, and we each had a small serving of pickled cucumber, onions and jalapeños. 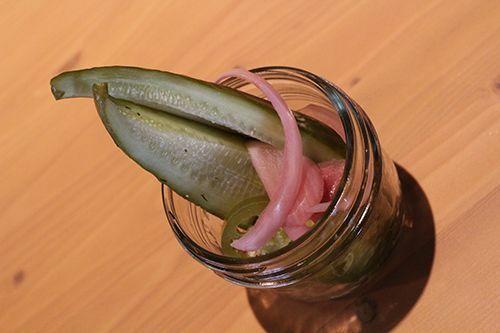 I personally like my pickles crunchy, salty, and sour, but the kind pickled by Plow & Harvest were sweet, slightly sour and a little soft for my liking. The pickled jalapeños were crazy spicy - in a good way - whereas the pickled onions were savoury and sour. Of the three, I definitely enjoyed the onions the most, and was glad to see that they are included in some of the sandwiches made here. 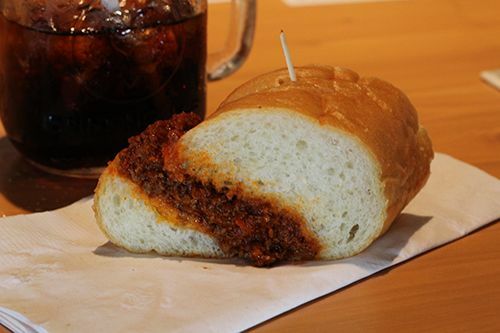 The first sandwich we got to try out was the Not-So-Sloppy Joe: Plow & Harvest secret recipe with ground beef, sweet peppers, and melted cheddar on soft artisan bread. And it was aptly named - no mess as the mixture didn't have too much sauce, and held together well on the bread while being eaten. The bread itself was nice and soft, with a bit of chew, but I would have enjoyed the sandwich more if it were more salty than sweet. 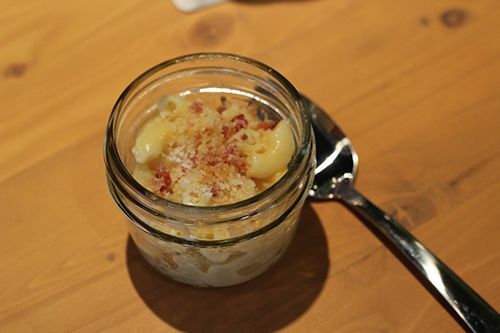 Cute little servings of the Baked Mac-N-Cheese with Bacon Breadcrumbs arrived to the table next. Unfortunately, this was my least favourite sampling of the night. The pasta was quite soft, and the cheese sauce was thin and runny, giving the dish little cheese flavour. The bacon breadcrumbs were fragrant, but quickly lost their crunch if they sat on the pasta for too long. I understand that everyone has their own preferences for macaroni and cheese - with mine being al dente pasta in a spicy, creamy, cheese sauce. Talking to others at the table revealed lots of different variations, as comfort food can be very personal. One thing I should mention though is that the mac 'n' cheese comes only as a side, and not a full dish. The next sandwich for the night was the Grilled Cheese, and I honestly did a double take, as it didn't look like a typical grilled cheese. 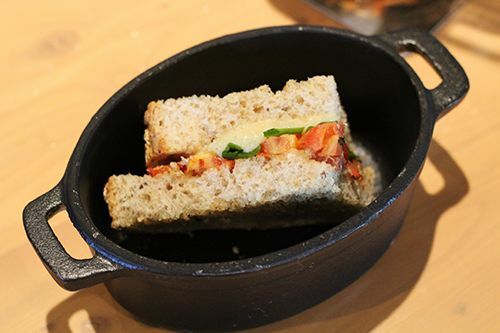 The Plow & Harvest grilled cheese contains a melted spicy jack cheese blend, smoky bourbon bacon jam, arugula, and roasted tomatoes on whole grain bread. The flavours worked really well together to make a sweet and savoury sandwich, as the cheese was melted perfectly, enrobing all the other ingredients inside. My gripe with this sandwich is the bread. The entire piece of bread was very crisp, but not in a grilled sort of way - it was as if the piece of bread was first toasted, then lightly grilled to give it a little colour, which made it quite dry. I prefer the bread to my grilled cheeses to be crisp on the outside and soft on the inside, which is why this one was so different. 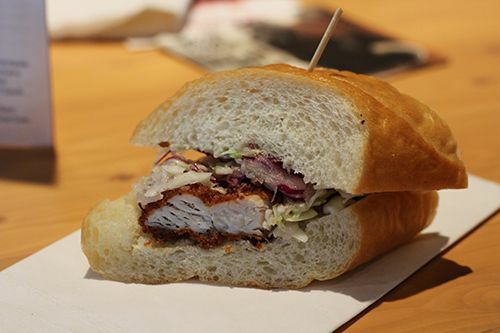 Last but not least, we had the Buttermilk Fried Chicken Sandwich, which I had been most looking forward to. Chef Bailey said that they marinate the chicken breast in buttermilk with salt for 24 hours, then deep fry, and top it with dijon mustard slaw, pickled red onions and jalapeños. The chicken was amazing. Crispy, juicy, and the spicy slaw completed it, cutting the fat. If there's anything I'm coming back to the restaurant for, it's this sandwich. I liked it so much that I had to try it twice to verify how good it was! 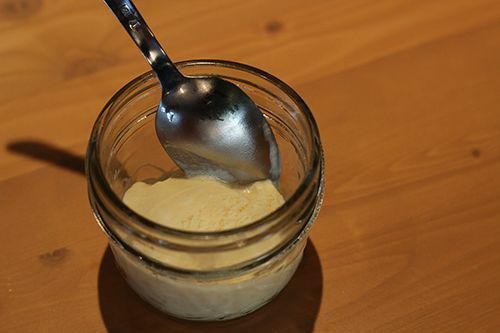 To end the meal, Chef Bailey secretly let me try out the Frozen Vanilla Custard that they get from Pinocchio's Ice Cream. It really does resemble a frozen, creamy creme brûlée. So delicious, and I can only imagine what it would taste like amazing in their frozen custard sandwiches! 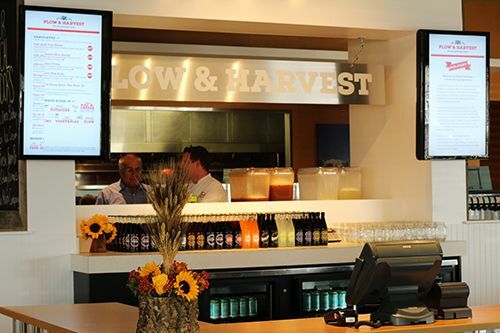 Overall, it was a nice night at Plow & Harvest to celebrate their grand opening. While there are still kinks to work out here and there, I hope it will become a great go-to for comfort food. 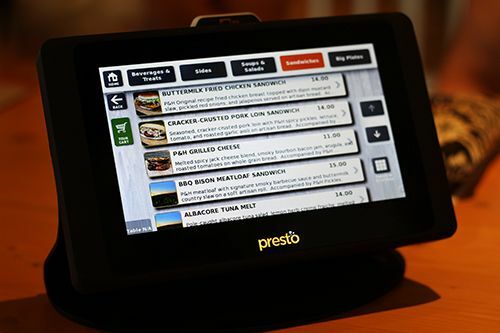 As discussed with Chef Bailey, the core menu items won't change often, but they may end up having different features each day available to order. 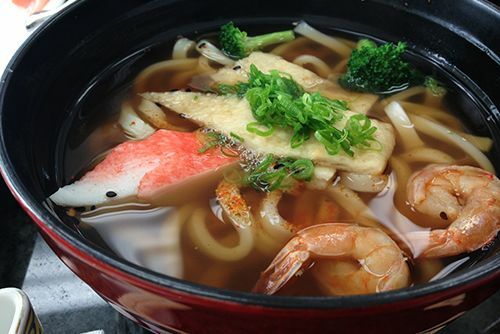 As many of you know, when local food is involved in the picture, prices tend to go up. Luckily at Plow & Harvest, the prices are quite affordable, sitting in the $14-$16 range for most plates. They aim to keep prices affordable, and the environment comfortable, as the restaurant wants to be an establishment people are willing to visit often to have familiar food and support local producers. With this Edmonton West location as their flagship location, the group behind Plow & Harvest aims to open a few more locations in Edmonton before expanding down to Calgary and the rest of Canada. Theres such a wide variation in local produce, that I wonder if the menu will be different in other locations that are bound to open up. Guess we'll wait and see! Disclosure: as this was a media event, views expressed in this post are solely mine. I was not expected to feature this restaurant on my blog, nor obligated to do so. This post is 100% my opinion, and as always, my priority is to you, the reader, to present an unbiased, thorough review.